Insurer Legal & General called on the Financial Conduct Authority to bring forward details of its investigation into 30 million polices sold between the 1970s and 2000 after a "disorderly market" reaction to the announcement. Legal & General does not outsource customer administration: our customers benefit from the continuity of a single product and service provider. Our operating practices ensure we provide good value to our customers, and we have operated a programme of ongoing product reviews for more than 10 years. FCA tells me "highly unlikely" exit fees will be wiped out. It's assessing the "fairness" of the 30m policies today not if were missold. Shares in insurance companies have tumbled this morning in the wake of the Financial Conduct Authority planning an investigation into 30 million policies sold between the 1970s and 2000. The inquiry comes amid concerns that loyal policyholders are not being given the same priority as new customers. The Financial Conduct Authority (FCA) is planning an investigation into 30 million policies sold by insurance companies between the 1970s and 2000. The inquiry comes amid concern that loyal policyholders are not being given the same priority as new customers and are facing high fees for substandard service. It will include pensions, endowments, investment bonds and life insurance. The FCA review, which is to begin this summer, is concerned about insurers using returns from so-called "zombie" funds - which are closed to new customers - to pay bills from other parts of their businesses. A large number of policies also include exit fees that can halve a policy's value if a customer attempts to switch to a cheaper provider. Clive Adamson, the director of supervision at the FCA, told The Daily Telegraph: "As firms cut prices and create new products, there is a danger that customers with older contracts are forgotten. We want to ensure they get a fair deal." It is "far too early to say" if and by how much insurance premiums will go up after thousands homes and businesses were damaged by the south coast floods, according to the Association of British Insurers. Malcolm Tarling told Daybreak that insurers would "do the maths" after flood victims had been allowed to safely move back into their homes. The flood waters may have mostly receded, but for many the distress of being flooded remains raw. Insurers and loss adjusters are playing a crucial role in the recovery process. A badly flooded property can take months to become habitable again, so insurers continue working around the clock to ensure that the drying out process is completed as quickly and as safely as possible. While of course this was a serious and significant bad weather event the current flood damage costs remain well below the severe floods of 2007 when insurers paid out £3 billion to customers. The Association of British Insurers estimates it will be paying out £1.1 billion to customers affected by floods and storms in the wettest winter on record. An estimated £1.1 billion will be paid in insurance claims to people whose homes, businesses and vehicles were damaged in floods and storms this winter, according to figures released today by the British insurance industry. Flooding Minister Dan Rogerson has described today's meeting with insurers as "positive and constructive" following flooding across the UK. We had a positive and constructive meeting with the insurance industry on the steps that they are taking to get people back on their feet as quickly as possible after the flooding. We were reassured that they have already put in place a range of measures to look after their customers, and we have agreed with them further steps to help the recovery process including providing a team of experts to advise on delivering the new repair and renew grants and a commitment to reviewing the cost of 24 hour flood helplines. We will continue to meet on a monthly basis to ensure an effective, coordinated response. Insurers assured Ministers the situation is under control and that customers have been helped speedily and effectively since the flooding and bad weather began in December. They emphasised the long recovery process ahead and their commitment to helping customers through this difficult time. 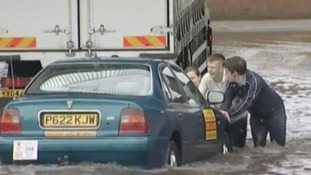 Many people in Hull are still recovering from the emotional and financial costs of 2007 floods.